Like passengers on the emergency evacuation chute, money is sliding from the pocketbooks of travelers to the bottom lines of airlines, as described in my story in today's New York Times. The article was not intended to exacerbate an already volatile relationship between air travelers and airlines, but I suspect that will be the result. My story follows a new report by US Travel, an industry trade association which proposes a number of sweeping changes in airport security. As a way of calling attention to the need for these changes (for cave-dwellers who have not experienced airport problems first hand) the report titled A Better Way, suggests that some people are cutting out discretionary flights because they are so frustrated with air travel. 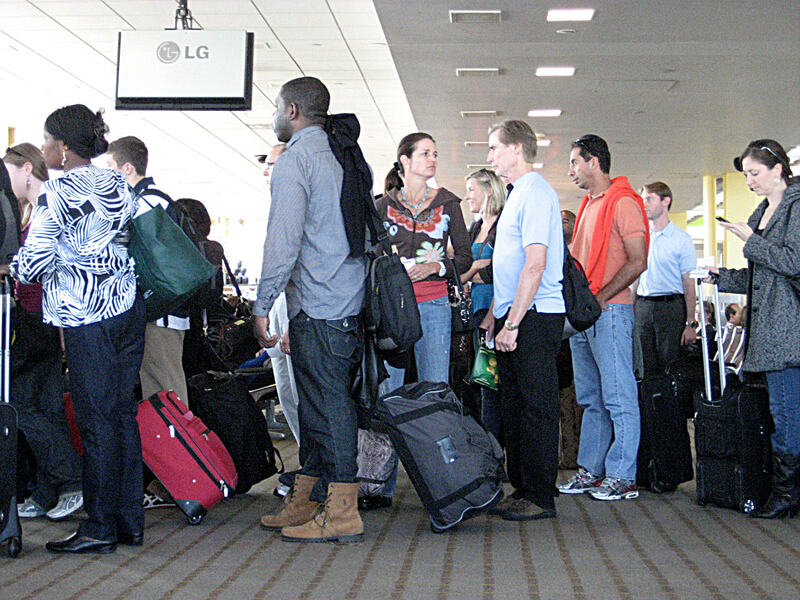 Since the imposition of bag fees, airlines in the United States have earned more than $6 billion. Hesitant to pay for what they think should be included in their low, low, ticket price, passengers have started toting those bags through the security checkpoint instead. Stop me if you've seen this, the stuffed-to-the-gills, headed-off-for-a-week, roller-propelled carry-on, now joining laptop case, purse, backpack, camera bag, shoes and overcoat on the x-ray belt. Yep, its a scene repeated more than a million times a day in America. My friend and frequent traveler, Dudley Williams, bites the bullet. He pays to have his bag checked. No matter, Dudley and others like him still get stuck in the same long security line as those who are bringing it all on the airplane. The secretary of homeland security says to increase staffing sufficient to handle the increase in passenger bags would cost about $260 million per year. And Dudley, and I, and you fellow travelers, will be paying for that with a per-boarding fee increase of $1.50 if the DHS secretary has her way. This is not to grumble about about the new fee. It is to explain that in the new economy the best metaphor for air travel is a water balloon. Put pressure in one place, another place will bulge. 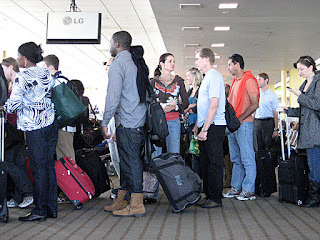 Baggage fees give the airlines a predictable source of revenue not as affected as air fares on the erratic price of fuel. The success of these fees has exceeded the best imaginings of airline executives. But credit them also with ticking off passengers and causing them to clog up the works at the checkpoints and making an already unpleasant security process even more so. Call me foolish, but I'm feeling optimistic that the tension will lessen given time and a sack full of ideas for other ways to raise money from the air traveler in order to keep air fares competitive. Some of these ideas I'm learning about now and will write about in a future blog. But first, I'm off to the European Society of Air Safety Investigators annual seminar. Stay tuned next week for updates from Lisbon.